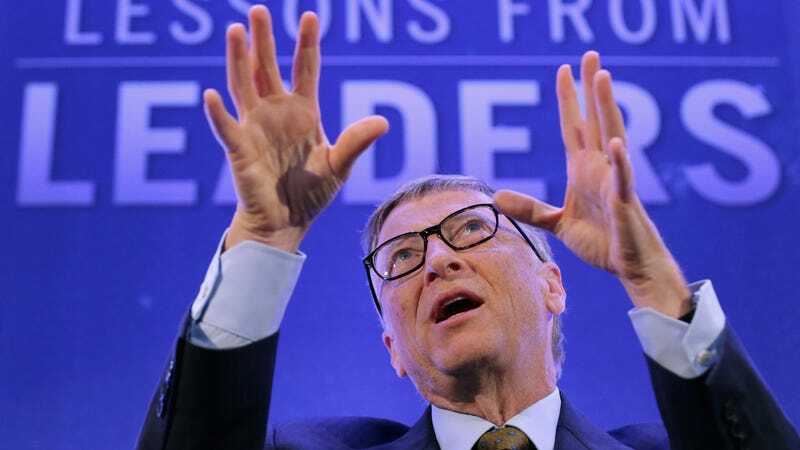 While speaking at the Massachusetts Medical Society and the New England Journal of Medicine, Gates started ringing the alarm bells about a potential new flu that could wipe out as many as 33 million people worldwide in a matter of just six months, according to the Washington Post. Gates, who said he’s typically an optimist when it comes to human progress, said the world and United States in particular are falling behind in “pandemic preparedness.” If there were weapons being built that could kill 30 million people, Gates said, governments would act fast to prepare for them. With biological threats, there is no sense of urgency. This is a problem that Gates has been harping on for some time now, raising the issue at the Munich Security Conference in 2016, the World Economic Forum in Davos last year, and in an op-ed in Business Insider after that. He cited a simulation by Institute for Disease Modeling to show just how deadly a new flu virus could prove to be when introduced to an unprepared populace, but that is far from the only source warning of such a possibility. Oxford’s Global Priorities Project released a report in 2016 showed that a natural pandemic, along with nuclear war, are the highest risks facing civilization right now. Joining those threats as a primary concern is a variation of the natural pandemic—a deliberately engineered pandemic, such as one that could be created in a bioterrorism attack. Advances in technologies that can be used to help prevent the spread of viruses can also be used by nefarious groups to create new threats and weaponize pathogens. CRISPR, a powerful gene editing tool that promises plenty of good, could enable such an attack by malicious actors. “The next epidemic could originate on the computer screen of a terrorist intent on using genetic engineering to create a synthetic version of the smallpox virus ... or a super contagious and deadly strain of the flu,” Gates warned in 2016. Despite Gates’ continuous hammering home the possibility of biological threats wiping out large chunks of the world’s populations, his message has largely fallen on deaf ears from those who have the ability to actually do something about it. Gates told the Washington Post that he’s met with Donald Trump to encourage the president to lead on the issue of global health security, only to have Trump tell him to follow up with officials at the Health and Human Services Department, the National Institutes of Health, and the Food and Drug Administration. Trump’s former National Security Advisor H.R. McMaster took multiple meetings with Gates, but he’s been ousted and replaced with war-mongering Lorax John Bolton, who has yet to meet with Gates and likely doesn’t have much interest in what he has to say unless it involves bombing someone. To his credit, Gates is positioning the effort that will be required to prevent a biological disaster in a way that would appeal to Bolton and other hawks in the Trump administration. “The world needs to prepare for pandemics in the same serious way it prepares for war,” the former head of Microsoft said during his speech. Congress did direct additional funding to the Centers for Disease Control and Prevention as part of the recent spending bill, a small step in the right direction after the agency had to cut its epidemic prevention activities by more than 80 percent earlier this year. “This could be an important first step if the White House and Congress use the opportunity to articulate and embrace a leadership role for the U.S.,” Gates said in the speech. While Gates waits for the Trump administration to start taking biological threats seriously, he’s doing his part to help where he can. He announced the Bill and Melinda Gates Foundation, in partnership with the family of Google co-founder Larry Page, will make available $12 million in grants to develop a universal flu vaccine that could protect against most strains of influenza. Still, Gates noted that vaccines take time to develop and deploy, and people will die in the meantime if other steps aren’t taken. Will the Trump administration eventually step up and take action against the potential loss of life that could be caused by biological threats? Given that the flu typically hits low-income communities the hardest, and the best solution to the problem is to make vaccines affordable and readily available, probably not. Are We At The Dawn Of The Age of Epidemics?